The products pictured above are the home coffee brewing machines available from Bunn. Bunn coffee brewers have some unique properties that make them better than many other brands on the market. For example, all Bunn coffee brewing machines use a hot reservoir style brewing process. That means that the reservoir which can hold up to 50 ounce for the full size machines and 48 ounces for the single serving brewer, is heated up to 200 degrees and held there so that there is always hot water available for brewing. Other brewers start with the water at a very inconsistent temperature which can have bad results under several circumstances. If the water is too cold, the flavor will get left behind and you will get weak coffee. If the water is too hot, the coffee may be too bitter. Bunn coffee makers have a stainless steel reservoir with temperature control so you always get consistent results with every pot. Another feature that makes Bunn coffee pots preferable to other brands is the sprayhead technology for dispersing water throughout the coffee grounds. In normal drip coffee makers the water drips through the grounds slowly and you do not get equal flavor extraction from all parts of the grounds. If some of the grounds in the center are over extracted then you get bitter tasting coffee. The sprayhead technology sprays water through the grounds quickly so that you get the proper turbulence for perfect flavor extraction. Finally, Bunn coffee makers brew your coffee fast. As long as the reservoir is heated up you can brew ten cups of coffee in three minutes. With other coffee makers, they have to heat up the water as they go which can lead to long brewing times which leads to bitter coffee. You will have more flavorful coffee faster with a Bunn coffee maker. Of the models shown above, the GRX, BX, and NHBX can be considered together because they are similar to each other. The only differences between the three models are in aesthetic appearances. All three of these Bunn coffee maker models have glass carafes and porcelain warming plates to keep the coffee warm once it is brewed. The NHBX and BX models are available with stainless steel accents while the GRX is not. The GRX model Bunn coffee maker is the most traditional looking model followed by the BX. The group is rounded out by the most contemporary looking model, the NHBX. The other two full pot Bunn coffee machines are the STX and BTX models. These Bunn coffee machines have thermal stainless steel carafes that do not need warming plates and that are dishwasher safe. Again, the main difference between these two models is aesthetic. The STX is graphite black with silver and stainless steel accents while the BTX is plain black with only stainless steel accents. The last Bunn coffee maker pictured above is the My Café personal brewing system. 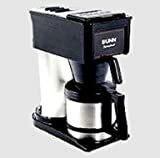 This coffee maker by Bunn makes single servings of coffee but it uses the same technologies as the full size coffee makers by Bunn. It has the heated water reservoir and the sprayhead system. 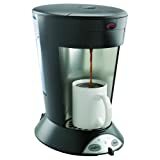 Some of the features unique to this Bunn coffee brewing system are a tea brewing button which triggers a pulse brew that allows for steeping action and a better cup of tea. The My Café uses single serving coffee pods that are slightly different from Keurig K Cups. Instead of little cups, this coffee machine uses flat disk like pods. You can buy the pods with brand name coffee already in them like the Starbucks product listed above or you can buy empty filter pods and put your own coffee in them using a pod maker. One thing that makes the Bunn single serving coffee maker different from Keurig coffee makers is that you have more control over the strength of the coffee you brew. You can adjust the amount of water that is sent through the pod much more specifically.